U.S. Wages Sisyphean War Against Afghan Corruption The U.S. has cited corruption as a major issue in Afghanistan for years. Yet as the U.S. military effort has begun to wind down, the Americans have made little progress in combating an endemic problem. 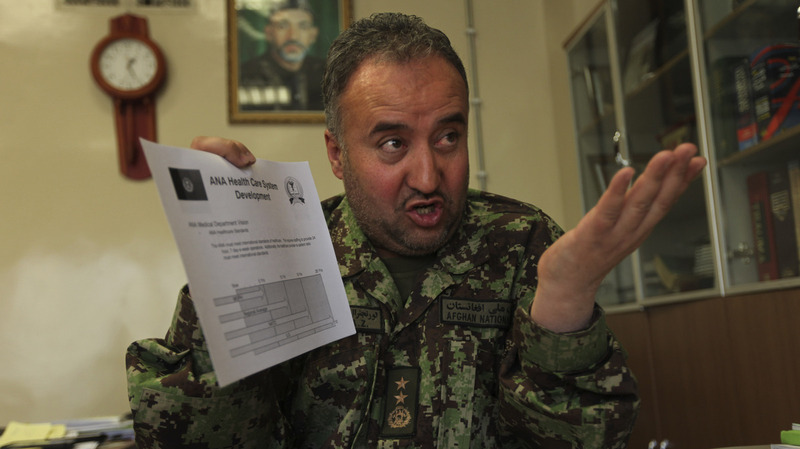 U.S. investigators allege that Afghan Gen. Ahmad Zia Yaftali stole tens of millions of dollars' worth of medicine from the Mohammad Daud Khan military hospital in Kabul. He has been removed from that post, but has not been prosecuted. He's shown here at the hospital on Dec. 18, 2010. U.S. officials consider widespread corruption one of the main barriers to a stable Afghanistan. They say it undermines support for the government and helps fuel the Taliban insurgency. The U.S. has trained Afghan investigators and assisted in high-level corruption probes, yet the U.S. has little to show for its efforts. The U.S. has created several task forces, including a one that's currently being set up: the Illicit Activities Initiative for Afghanistan, based in Washington. Gen. Rick Waddell, the American in charge of anti-corruption efforts in Kabul, told NPR in May that the U.S. is working closely with the Afghan government to bring corrupt officials to justice. "Ideally you would investigate and prosecute, sentence and imprison these sorts of people. But this isn't going to happen overnight," Waddell said. And when confronted with critics who say the entire government is corrupt? "I would say that we work with good Afghans at all levels of the government," he says. "What we tell them is let's go after the ones that we can, you go after lower-hanging fruit to make a difference." But as defense analyst Anthony Cordesman notes: "The real problem with the low-hanging fruit is, why [is it] low hanging?" Cordesman, with the Center for Strategic and International Studies in Washington, has written extensively on Afghanistan. "Because they don't have political support or because someone wants to use an ax to take them out of power," he says. In other words, they weren't big enough players to matter. Afghan President Hamid Karzai is greeted by Japanese Prime Minister Yoshihiko Noda in Tokyo on July 9. The international community recently pledged $16 billion in additional aid, but wants Karzai to crack down on rampant corruption. The problem is the U.S. has had little success in going after senior Afghan officials accused of corruption — those with ties to President Hamid Karzai. American officials tell NPR they helped prepare more than a half dozen high-profile corruption cases against government ministers, provincial governors and senior military officials. All the cases are languishing in the Justice Ministry, they say. One of the symbols of corruption in Afghanistan is the Mohammad Daud Khan military hospital. Americans allege that the man in control of the hospital, Gen. Ahmad Zia Yaftali, stole tens of millions of dollars' worth of drugs and pharmaceuticals and sold them. He was removed from running the hospital a year-and-a-half ago, but was appointed elsewhere and has not been prosecuted, says Nader Nadery, a former member of the Afghan Human Rights Commission who has joined the Americans in pressing this and other cases. "I asked for the president not only to remove those people who are known for their bad practices and undermining his own legacy, but also to start prosecuting people," he says. Nadery says he never heard back from Karzai's office. Meanwhile, American investigators working on the anti-corruption task forces have left in frustration. Others privately acknowledge their efforts have achieved little. They estimate that hundreds of millions of American dollars have been lost to corruption. Ideally you would investigate and prosecute, sentence and imprison these sorts of people. But this isn't going to happen overnight. Some analysts, like Cordesman, say the U.S. is partly to blame for the corruption. It flooded the country with money but didn't insist on monitoring how it was spent. Several top current and former officials tell NPR the issue of corruption never got the attention it deserved in Washington. "Administration officials certainly talked about the importance of anti-corruption efforts," says Seth Jones, who served as an adviser to the American command in Afghanistan last year and now works for the RAND Corp.
"But when it came to specific, concrete, sustained efforts to target and reduce corruption within the Afghan government, there was not a lot of stomach for it," he says. Because officials believed they needed Karzai to fight the Taliban, they were reluctant to cut off aid if he didn't deal with corruption. John Sopko is the new special inspector general for Afghanistan reconstruction. The man Sopko replaced told Congress in December that corruption in Afghanistan is almost insurmountable. "I can't assess that and I wouldn't want to assess that," Sopko says about his predecessor's statement. "And I'm approaching this job by not looking backward." Yet in front of him is a real challenge. 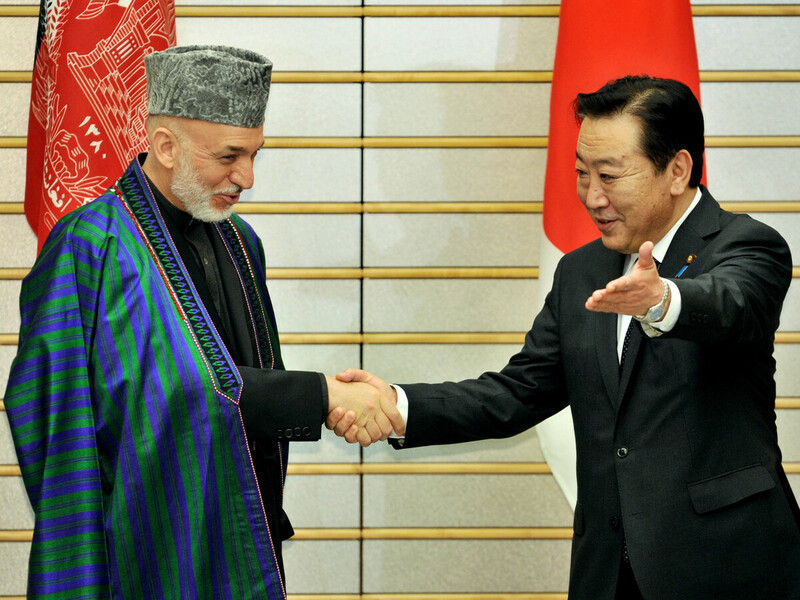 Sopko says it's significant that Karzai just signed a pledge during an international donors conference in Tokyo. "And it makes fighting corruption a key goal. The bottom line is we are going to hold everybody accountable," he says. And that means accountable for the money still to be spent in Afghanistan. The United States and others have pledged to help the Afghan government in the coming years to the tune of $16 billion.